Our large world fascinates and amazes kids and they thirst to gain knowledge about different cultures and destinations. Reading books is one way to learn about far away places. One of the most majestic locations in the world is Mount Everest, the world's highest mountain peak with a peak elevation of 29,035 ft. In the shadow of the mountain live the Sherpa, a group of people that are well known for their expert mountaineering skills, acting as guides and porters on expeditions in the Himalayas. This dangerous occupation garners much respect in the Nepal. 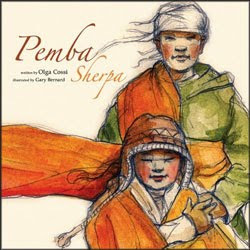 With a quiet and respectful tone, a book by Olga Cossi called Pemba Sherpa tells a story about a courageous young Nepalese girl named Yang Ki who pursues her dreams to become a guide despite preconceived notions of women's roles in the Sherpa community. Young Yang Ki looks up to her older brother and wants to help him carry wood down a long, steep trail so that she can also build up strength and skills necessary in learning to become a Sherpa guide. He laughs at her and tells her that girls cannot become guides. She secretly follows him up the trail and comes to his rescue in a time of need. The book is written in a heart-touching way that makes the reader feel like they a grandchild listening to a beloved grandfather recount a proud family moment. Although the book is meant for slightly older readers (early grade school), my preschool daughter listened to the story intently and asked questions about mountains and mountain climbing. With a subtle approach the book teaches about the magnificent Everest Region, includes terms such as "rumal" (scarf), and also promotes gender equality. Illustrator Gary Bernard successfully brings out the solitude of the remote, mountainous setting in his sketched pencil drawings by using muted, earthy watercolor tones. Pemba Sherpa is dedicated to Pemba Doma Sherpa, a famous Nepalese female mountaineer who was the first Napalese woman to climb Everest's North face.